Ugandan politicians and political analysts say the use of money to buy votes has eroded and completely destroyed democracy in the country. They say a quick remedy is needed to reverse the status quo if Uganda is to realize democratically elected institutions and good governance. This was echoed during the National Symposium on Money in Electoral Politics, 2019. 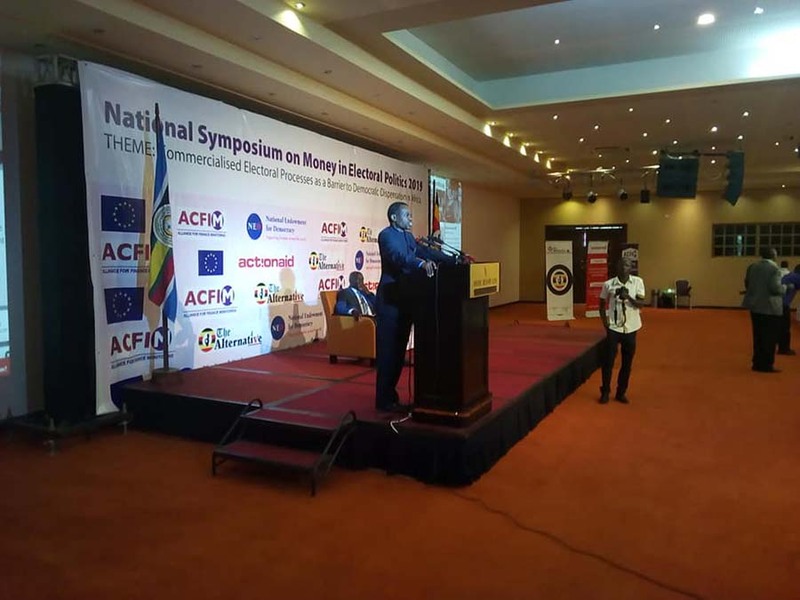 The Guest Speaker at the Symposium, Patrick Loch Otieno Lumumba, a staunch Pan- Africanist Kenyan Lawyer and former Director of Kenya Anti- Corruption Commission, said: “Commercialisation of politics has negative effects on the socio-economic and political status of a country. It’s only through prayers that we can reverse this state of affairs in Africa. But a prayer without action is nothing but superstition”. He said the democracy practiced in Africa was conceived by former colonial masters, where there is need to put in place home grown democracy. “Commercialisation of politics is evident in situations where those who wield political power, keep the masses in abject poverty and give them financial handouts, during campaigns to keep themselves in power”, he said. He castigated former colonial masters for portraying Africa as a continent where tribal wars are the order of the day. Dr Kihura Nkuba, also a Pan Africanist and History lecturer, said African democracy was ruined by commercialisation of politics, as taught and dictated by the Western supper powers. He said politics and money are two different entities and should not confuse people. “Politics is the control of power, while the control of money is economics,” he said. He amused participants when he said; there is no democracy in the United Nations (UN) General Assembly and Security Council. “The UN General Assembly and Security Council have permanent members who dictate on outcome of World decisions. Is that democracy?” he asked.